Get terrific tips, training solutions, interesting pet FAQ’s, pet product reviews, lifestyle, events, pet wellness and help a missing pet find their way home. This week, we want to share an emotional, heart-wrenching video with you that shows all of the trials and tribulations our soldiers (men, women, and canine) go through every day. Happy Veteran’s Day! Thank you for serving our country! Some dogs love winter whereas others would rather cuddle up with you under a warm blanket by the fireplace. Either way, she must go potty at some point. And, you should be ready to protect her from the bitter cold outside. Most pet parents believe the common misconception that a dog’s coat is enough to protect them from the cold. This isn’t always the case. 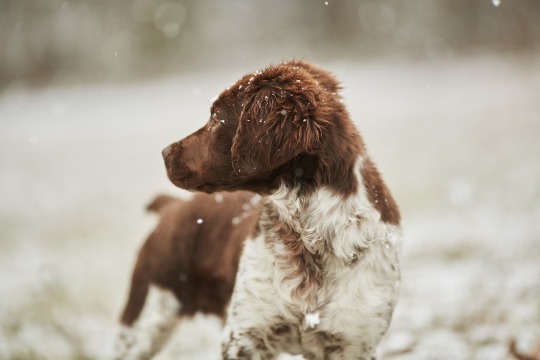 Some dogs can handle the winter weather better than others, but all dogs should be protected and observed carefully during the winter months. If your dog stays out for too long, there’s a risk of her getting frostbite. Frostbite begins when your dog’s body gets cold. Once your dog’s body (ours works this way too) gets cold, blood is pulled away from her extremities to maintain warmth at the core of her body. As your dog continues to be outside, her ears, paws, and/or tail could then form ice crystals and damage the tissue. Frostbite is a scary thing because it’s not immediately recognized. You can watch for pale or grey skin and feel her skin to check to see if it feels cold. The other life-threatening condition you need to worry about is hypothermia. Hypothermia sets in when your dog spends too much time outside in the cold temperatures. Dogs who are wet, senior dogs, and dogs with health conditions will likely be affected sooner. In mild cases of hypothermia, your dog starts to shiver and her ears, tail, and/or feet get cold. As hypothermia continues, she might appear sleepy, depressed, and weak. Her muscles will begin to stiffen, and her heart rate will drop. The general guideline is, if it’s cold to you outside with your coat on, it’s too cold for your dog. We’ll talk about more tips to keep your dog happy, healthy, and warm this winter below. Avoiding times where the sun isn’t shining is a helpful tip. Take your dog for walks when it’s a little warmer and the sun can reflect off her coat. Plus, on top of keeping her warmer, you’ll both soak up some Vitamin D.
Tip 2: Is the Floor Cold? If your floor isn’t carpeted, or you don’t have heated floors, the floor could become quite a cold place for your dog to sleep. Choosing the right bed can help your dog stay warm while indoors. A nice, comfy bed is just what the doctor ordered on those cold winter days. If you have an older dog, you may want to consider purchasing a heated bed. Senior dogs may have aches in their joints which will worsen when they’re cold. And, finally, make sure you don’t place her in a ‘draft-zone.’ Usually, this is next to a door or an old window. Make sure you pick out a warm spot in your home. You don’t want your dog in a drafty area of the house, but your also shouldn’t put her bed right next to the heater. If she’s too close to the heater, she can easily get burned and/or overheated. You may have noticed when it’s cold and dry outside (like many days in winter), your skin also dries up and you need to go grab the lotion. Your dog’s skin is the same way. To prevent dry, itchy, flaky skin, you can rub her with coconut oil on an as-needed basis. We don’t know about you, but many people develop ‘foot cracks’ in the winter. Just as people do, dogs can develop cracks in their paws. If your pup has furry feet, trim the hair that grows between her pads to prevent ice from building up. The salt laid out in the winter can also become a huge problem for your dog’s sensitive paw pads. Winter salt is toxic and will burn your dog’s pads if it’s not washed off. If you go for a stroll around the block, be sure to wash her pads off afterwards. Or, if your dog will accept them, doggy booties can be worn to protect her pads from the cold temperatures and winter salt. Don’t be afraid to enjoy winter with your dog but keep these tips in mind to make sure your dog is safe. And, don’t forget winter time is the best time for snuggles! Keep Your Dog Safe on Halloween! Hello, everyone! This week we must discuss Halloween. It’s coming fast. Only a few more days and the time will be here. Usually, we’re so wrapped up in finding costumes for our children and getting them ready, we don’t have time to stop and consider our pets. But, many pet lovers aren’t aware of the dangers their dogs face on this creepy crawly holiday. Some adults absolutely love this holiday. Other’s don’t. But, our children sure love it. Our dogs usually aren’t the biggest fans, though. Don’t stress. We will review a handful of safety tips to keep your doggy safe, happy, and healthy during the October 31 celebration. This one you may already know. All forms of chocolate, especially baking or dark chocolate, can be dangerous or even deadly to your dog. If you’re worried your dog may have eaten some Halloween chocolates, take her to the veterinarian and keep a close watch on her behavior. Symptoms of chocolate poisoning include vomiting, diarrhea, increased heart rate, rapid breathing, and/or seizures. You might ask now, “my dog can’t have chocolate, but can’t he have a few pieces of candy?” Nope. Most candies contain an ingredient that’s toxic to our dogs, too. Xylitol! Even the smallest amount of Xylitol can cause a severe, sudden drop in blood sugar followed by loss of coordination, seizures, coma, or death. That’s a serious risk. While small amounts of pumpkin can be fed safely to many dogs, ingesting uncooked, potentially moldy Halloween pumpkins can cause big problems. Gastrointestinal upset is a potential result of your pup eating the ‘wrong’ pumpkin or too much pumpkin. And, intestinal blockage can occur if large pieces are swallowed. Another danger with pumpkin? Some types of mold produce mycotoxins which can cause neurologic problems in dogs. You might be a bit confused right now because pumpkin can be good for dogs. Learn how much is too much and what types of pumpkin your dog can have by clicking here. Keeping your doggy indoors is the best idea on Halloween. But, if you’re staying home to hand out candy, your door will be opening and closing nonstop. Plus, not only are strangers coming to your door, they’re strangers in all kinds of different costumes. There’s no big shock that your dog may become uncomfortable, territorial, or even aggressive on Halloween with the chaos and confusion. Putting your dog in her crate for a little while, or in a room she’s comfortable in, will significantly reduce your dog’s feelings of stress and anxiety. With all the chaos and people coming in and out in their costumes, you may be tempted to find an alternate location for your dog. Some dog lovers may be tempted to put their dog on a runner out back away from all the trick-or-treaters. Or, in a fenced in area in the back yard. Unfortunately, our world is not the nicest sometimes and it’s better to be safe than sorry. Pranksters have been known to tease, steal, injure, or even kill pets on Halloween. I hate writing that. But, it needs to be said to keep your loved furry family safe. If you do decide to dress Rover in a costume and go out for the evening, make sure it isn’t dangerous or annoying to your doggy. Costumes shouldn’t restrict your dog’s movement in any way, hearing, eyesight, or the ability to breathe. Your dog must always also be supervised when the costume is on to prevent any accidents from happening. 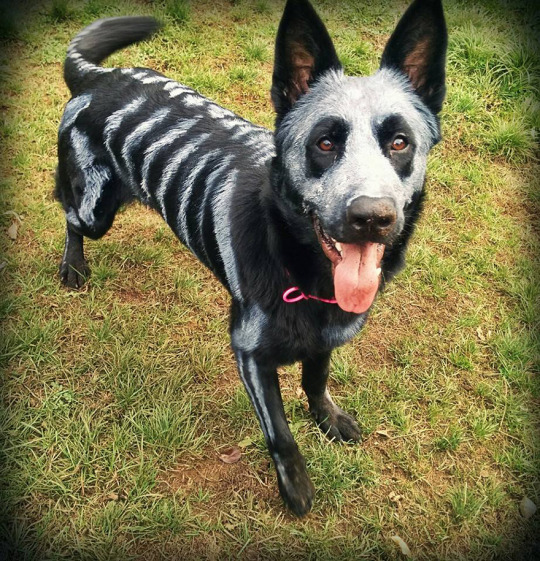 Don’t wait until Halloween night to put your pet in a costume for the first time. Remember, any time you want to introduce your pup to something new, it’s best to go slow. Be sure to grab your pet costumes early and put them on for short periods of time (piece by piece, if possible). Make this a positive experiencing by showering your dog with praise and treats. If, at any time, your dog appears to be distressed, anxious, or uncomfortable, immediately remove the costume. If you don’t want to try the costume idea, you could always try a festive bandana for your pup to walk around with while you’re trick-or-treating. If your dog were to escape and get lost, having the proper identification will increase the chances that she will be returned. Collars and tags are helpful if your pup finds someone who is willing to help him find his family, but microchips offer permanent identification just in case their collar or tag falls off. If your dog has a microchip, make sure the information is up-to-date in the recording system. If she doesn’t have a microchip yet, this may be the right time for you to get this done. Not only is Halloween almost here, the other holidays are approaching quickly. This article isn’t meant to worry you but rather to prevent accidents from occurring. And, make you aware of the dangers lurking near your furry family member(s). Keep your doggy safe this holiday season. My Cat is Spraying and I Don’t Know What to Do! The most common behavior problem in cats, as reported by pet parents, is going potty in the wrong areas. 10% of cats eliminate in an area that’s not their litterbox at some point in their life. These cats are usually urine marking which isn’t a litterbox problem (fortunately and unfortunately). Urine marking is a form of communication used by cats. Exactly Why is My Cat Urine Marking? Animals who live in social groups and depend on one another to survive have sophisticated communication skills. It’s important not to think of a cat’s behavior as like a dog. Cats have a unique social structure and are extremely different from dogs in their social life. If give the opportunity, cats go off on their own and claim certain territories. They are independent animals, and although they may share their territory with other cats, they avoid one another whenever possible. Cats are unlike dogs in that they don’t defend their territory (most of the time) with a fight. Instead, they mark their territory in a different way that leaves a message. Most times, this is where the urine marking comes in. By urine marking an area, the cat is letting other cats know of his presence. He wants other cats to know where his ‘property lines’ are, how long ago he was in that particular area, and how long he’ll likely be away. Cats can also leave a message like an advertisement, ‘I’m looking for a mate,’ with their urine. Although our traditional cats who live in our houses don’t have to hunt for their food or search out a mate, they still look at their world the same. They don’t fully understand they’re in a house where ‘this isn’t permitted.’ They use the instincts nature has provided to them. They will set their instincts aside in certain situations, though. These are situations you, as their pet parent, have to make possible for them. If they feel their world is predictable, and without conflict, AND they’re spayed or neutered, they don’t really have a reason to mark. But, if they are stressed about something, or they want to find a mate, that’s when you run into problems. How Do I Know if my Kitty is Urine Marking? Okay. This is the hard part. Cat who urine mark also use their litterbox to go potty. That’s where the confusion comes in. · Urine marks are generally deposited on vertical surfaces. If you have ever heard of a cat who ‘sprays,’ this is what we’re talking about. When spraying, a cat usually backs up to an object like the side of a chair or a wall, and stands with his body erect and his tail extended straight up in the air, while spraying urine onto the targeted object. · Urine marks usually contain less urine than your cat would generally pee into their litterbox. · The odor of the ‘marking’ urine is extremely strong. Not only does the spray contain urine, but also contains extra communication chemicals. · Being an unneutered male. · Multiple cats in the household. · Any change in the household that could cause stress. · Neuter or spay your cat. · Prevent your indoor cat from seeing other neighborhood cats. Before treating the issue as a behavioral problem, you must rule out any medical problems by visiting your veterinarian. 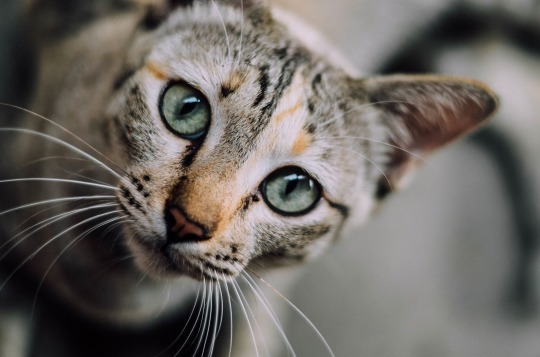 Although there’s no medical problem that would specifically result in urine marking, if your cat is in any sort of pain or experiencing any medical issue, this could lead to stress which may lead to urine marking. Once your veterinarian has cleared your kitty, it’s time to figure out which cat is marking. If you aren’t sure if your cat is spraying, or you’re not sure which cat is spraying, you can ask your veterinarian about something known as fluorescein which causes urine to glow blue under a UV light. · Be sure to provide enough litterboxes. The general rule is one litterbox per cat in the household. And, if you have a two-story home (or larger), be sure there’s a litterbox on each floor. · Make sure litterboxes are placed in low-traffic areas. · Scoop the litterbox at least once per day. · Play with your cats to reduce stress and conflict. · Thoroughly clean any accidents with an enzymatic cleaner specifically designed to neutralize pet odors. If you clean it without an enzymatic cleaner, and you can’t smell it, that doesn’t mean your cat can’t. Although this is extremely frustrating (and disgusting to us), remember to be patient with your cat. Remember he’s not doing this to hurt you in any way but rather following his/her instincts for survival. You should never punish your cat, rub his nose ‘in it,’ or throw things at your cat to get him to stop if you catch him in the act. And, absolutely never clean up with ammonia. Ammonia attracts your cat to the same area because urine contains ammonia. Don’t forget to grab an enzymatic cleaner. Everyone always talks about how to socialize your new puppy, but we don’t often hear about how to socialize a new kitten. Socializing your kitten is important, too. Leaving the litter can be traumatic for a little kitty. Even when a kitten is over eight weeks old and fully weaned, a new environment is still new. And, it can be overwhelming. Before you bring you adorable little kitten home, you want to make sure she will have a smooth transition into her forever home. A smooth transition requires many factors to be in order including introductions to other humans, other cats, and other dogs. 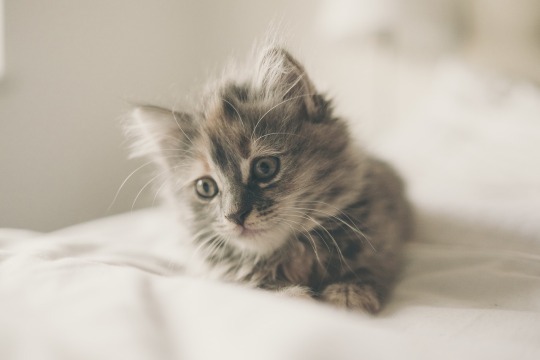 In this article, we’ll talk about five ways to ensure your cute kitty has a smooth transition into your home. When your kitten first arrives home, don’t introduce her to a bunch of new people. You can introduce her to one or two people at a time to avoid overwhelming her. Don’t worry if she still appears to be overwhelmed. Remember, this is all completely new to her. Choose a quiet place for your introductions. Let each person who sees her cuddle her for a decent amount of time. And, don’t forget the kitty treats. She will likely feel more comfortable associating new people with yummy snacks. When introducing your kitten to another kitten or a dog, have someone who she trusts hold her from a distance. Offer her treats while you’re introducing her. Gradually decrease the distance from your other furry companions as long as your kitten feels comfortable. Your other pets should also be provided with treats and obedience commands (for dogs). Don’t forget, your kitten is new for them too. Don’t forget your other furry loved ones while caring for your new kitty. You want them to form positive associations to one another. Making sure you aren’t making any of your furry family members uncomfortable during this process is crucial. Repeat this process for each of your furry babies one at a time. Once you know everyone is safe, you should give your pets the freedom to approach one another if desired. Don’t forget to reward for good behavior. P.S.- Make sure none of your furry family members feel as if they can’t escape the situation. Your dog should be able to walk away. And, your cat(s) should be able to hide or get away if they want to. In the beginning few days, if you can’t supervise, your kitten should be confined to a specific area. Usually, this is the bathroom since it’s easy to clean up and large enough for your kitten to walk around. You want your kitten to feel safe. Make sure she’s in the bathroom by herself so she has time to relax. She will become accustomed to new sounds, new smells, and new sights, as she is spending time to herself. If you have other cats, don’t forget to grab another litterbox, too. Generally, the recommendation is one litterbox per cat. Some cats don’t like to use other cat’s potty areas. Most people absolutely love kittens. What’s not to love, right? Take advantage of your tiny kitten’s adorable face to socialize him or her with others. Once your kitten appears to be relaxed in your home with your current pets and family members, you can allow your friends and other family members to come in and cuddle your new addition. Ask your friends or family to hold your kitten, give her treats, and play with her. If possible, allowing both men and women to do so is recommended so your cat doesn’t have a gender preference when she gets older. Allow your kitten to play with children also (ensuring children are acting appropriately with the kitten). If your kitten forms positive associations with all different types of people now (all ages, both genders, etc. ), she is more likely to hang onto those impressions throughout her life. Socializing a kitten doesn’t take too much effort, but you’ll notice the positive effects from socialization for her entire life. A socialized adult cat is friendly, confident, and happy to be in the company of others. Make a point to hold your kitten multiple times per day. Touch her toes, ears, and tail, not only to ensure she is comfortable with others handling her but the veterinarian as well. This will mean less stress for both you and the vet. Finally, don’t forget to be patient. Just as all dogs are unique, all cats are unique as well. Each cat has his own personality. Some cats are outgoing whereas others are shy and take more time to warm up. Training your dog to stay is a useful command and it’s a part of the ‘general obedience’ guidelines for a well-rounded dog. A dog who knows the ‘stay’ command is more likely to have manners when you have guests, while you’re eating a meal, and during travel. Like other commands, ‘stay’ may time some time. It’s important to remain calm, patient, and consistent while your dog is learning. Don’t forget, positive reinforcement methods should be utilized to prevent behavioral problems and increase the bond you share with your dog. What Do I Need for this Training? You don’t need much to train your dog how to stay. All you need is a quiet area free from distractions and a handful of kibble or treats (don’t forget your dog’s diet should not be over 10% treats). Before teaching your dog to stay, be certain she understands the ‘sit command.’ This won’t work if she hasn’t learned how to sit on command yet. As stated above, be certain your dog knows how to sit. If your dog doesn’t know how to sit, you’ll need to teach her this before moving onto step 2. Step 2 involves those treats we asked you to grab earlier. Place the treats in your pocket or cup them in your hand for now. Then, tell your dog to sit when you’re ready. Take a few steps back while saying the word ‘stay.’ You’re going to have to sound a bit like a broken record during this step. Repetition is important. If your dog doesn’t move, say “okay” to let her know it’s acceptable to get up. Once she returns to you, give her a treat. She’s done a great job. If your dog starts to follow you rather than stay put, simply say “no.” Walk your dog back to the same location she was sitting in before and try again. Some dogs may catch onto this immediately whereas others may take weeks to learn. Every dog is different and learns differently (and some dogs are a bit stubborn, right?). Be sure to repeat step two multiple times per day until your dog has mastered the command. Once a few days go by (or longer) you can move onto step 4. Now that your pup has mastered all the steps mentioned above, we’re going to move onto increasing the distance between us and our dog. Increase the distance by taking a few more steps backwards than you did before while repeatedly saying the word ‘stay.’ If your dog isn’t quite ready for you to go that far away, bring her back to her sitting area and try again just as you may have before. Once your dog has mastered the ‘stay’ command inside the house, you can move onto different areas like your fenced-in yard, dog park, or other area where you know your dog is safe. Bringing your dog away from your home is also important as your dog will learn how to listen to you with distractions. Don’t forget to be patient with your dog while she’s learning a new command. To help her learn, you should bring her for a walk first so she’s calmer and better able to pay attention to you. You want your dog to be in a peaceful state of mind, so you know she’s listening attentively. If you notice your dog having a hard time concentrating, don’t worry. Wrap it up and call it a day. Try again tomorrow. Today, October 1, is National Black Dog Day. This may sound a bit ‘odd’ at first. But, researchers at animal shelters have uncovered an upsetting truth. When a dog lover is searching for a furry companion, dogs who are black or dark in color are passed by without the slightest consideration for adoption. The phenomenon has also been coined as ‘dog racism.’ And, has inspired ‘black dog’ campaigns showing adorable professional photographs. The photographs are designed to show the beautiful features black dogs have and capture their personality in the portrait as well. There are a few different reasons dog lovers may choose to pass that adorable, black lab mix. The color black absorbs light. Since black absorbs light, a black dog’s features may not be as apparent is a light-colored dog. This makes our adorable family friend harder to take pictures of. The other aspect of this component is black is associated with evil. Dogs in horror movies are also generally black. People may unconsciously pass by that black dog due to misconceptions in their lifetime. And, some dog lovers think black dogs are simply too plain. There is nothing ‘special’ about them. Dark-colored dogs are thought to be bland and ordinary. Researchers at the University of British Columbia conducted a study where members had no idea what was going on. The participants didn’t know the purpose of the study. The main researcher, Stanley Coren, selected 60 colleagues and students and showed each of them photographs of black, brown, and yellow Labrador Retriever. The results were just as expected. Black labs had lower ratings regarding attractiveness, adoptability, and friendliness. The previous section leads us to this one. A study conducted by three psychologists from Penn State supported Coren’s findings that ‘black dog syndrome’ may truly exist. Sixty-five participants were chosen for this study. After the participants were recruited, they were to look at pictures of dogs and cats from various breeds and colors. The participants were asked for their impression of each animal as a pet. Not only was ‘black dog syndrome’ confirmed in this study, but ‘black cat syndrome’ was as well. Black animals, dog or cat, ranked at the bottom of the score chart for perceived adoptability and friendliness. Black dogs were also perceived to be more aggressive than dogs of other colors. Even if you already have dogs in your household and aren’t interested in adopting another, there are other ways you can help spread ‘black dog’ awareness. First, if you know of anyone searching for a puppy or adult dog, share a bit of information about how the black dog is least likely to be adopted. 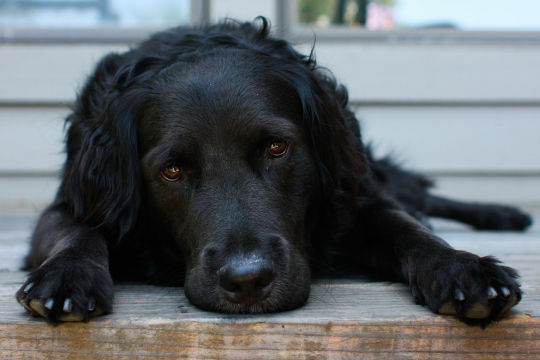 Share as much information about Black Dog Syndrome as you can. Lets spread the word! And, of course, if you are searching for another furry family member, remember this article and go back to the low chance of adoption. We’re not saying you absolutely need to adopt a black dog, but recommend providing them the same consideration provided to lighter-color dogs. We always hear about how to prepare your family for a photoshoot. But, rarely do we hear how we can prepare our dog. All of us here at Petkey understand how much you love your dog. And, we want to share a few tips with you about how to make the most out of your dog’s glamour hour. Most of us take photographs of our dogs with our smartphones. But professional photographs can provide an excellent way to grab shots in high-quality you may not have captured yourself. And, a professional photoshoot allows you to get in the picture, too! We want to spend our money wisely. Photoshoots aren’t cheap. Make sure you choose the right photographer to get the job done. The first place you can search is your veterinarian’s office. Sometimes, veterinarians can point you in the right direction when it comes to a professional pet photographer. You can search the web for ‘pet photographer in Buffalo, New York’ for example and see what comes up. Or, here’s where Instagram can come in handy. Type in the hashtag #petphotographer, #dogphotographer, or similar. You’ll likely come up with hundreds of amazing photos. Pay close attention to the style of each photographer. This will help you narrow down your options. Which photos do you like best? Which poses? Which photographer captures not only the beauty of a dog but the personality as well? Where Should the Photoshoot Take Place? This is the next question. Location. Where should we go to have the photos taken? Your photographer may have suggestions, but she will probably recommend an area that offers plenty of sunlight in a certain time of the day. After this point, it comes down to where your dog is completely comfortable and can be himself. When it comes to a dog’s photoshoot, flexibility and patience is critical. If the weather isn’t cooperating, don’t panic. Plan a different day. If your dog isn’t cooperating, don’t panic here either. Photos taken in your backyard could be the best photos you could capture. The best photos are going to be taken when your dog is completely herself. Even if the weather is a little on the ‘cooler’ side, don’t forget to bring plenty of water and treats for your pup. The treats could serve as an excellent (and enticing) reward for your dog during her photoshoot. Allowing your dog to be herself is critical and emphasized in several areas in this article. It’s tempting for us to try to make a photoshoot as perfect as possible. But, that’s not really what we want. We want our dogs (and ourselves) to look as casual and real as possible. And, let’s face it. We’ll end up quite disappointed if we walk into a photoshoot expecting our dog to be still the entire time. Your dog might not want to stare directly into the camera or stand exactly where she’s placed. That’s okay. Understand that is to be expected. And, any professional pet photographer already knows this. Let the photographer take the worry off your hands. All you need to do is stay happy and be calm. If you’re frustrated, your dog will sense that frustration and it could turn the photoshoot into being a loving act into an upsetting one. Let your dog be a dog. If you take nothing else from this article, simply take that statement. If you allow your dog to act exactly as she does when she’s not being photographed, you’ll be surprised at how fantastic the photographs turn out. If you have any professional photographs or end up taking some with the advice of this article, we would love to see them. Feel free to share them on our Facebook page for the world to see! My Puppy Needs to Sleep... And So Do I! Yay! You adopted a dog. And, not just any dog. A PUPPY! Adorable. Fluffy. Perfect. You, your family, and your puppy are so excited it’s hard to contain the happiness you’re feeling. Adding a pup to your family isn’t something to take lightly. And, oh. The life you will have sharing experiences with your dog will be priceless. But, you’re exhausted. Your puppy isn’t sleeping through the night. She’s staying up barking, whining, and crying. She doesn’t want to be without you. And honestly, she probably has no idea what she wants either. Can’t blame her, right? Dogs are social animals and they enjoy the company of others. On top of all the other changes she’s gone through, she has been taken from her mother, too. 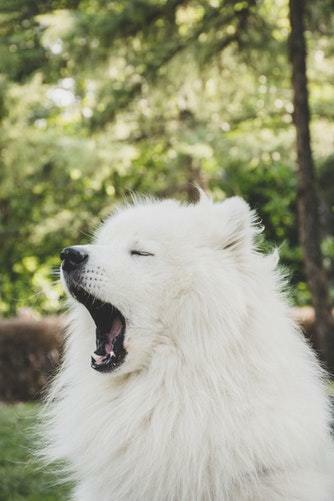 There are a few tips to help your pup sleep through the night, so you can once again get that sleep you need so badly. If you play with your puppy during the day, she’s much more likely to sleep through the night. They’re tired out. A tired dog is a happy dog. And when they’re worn out, they want to sleep as badly as you do. Even if your pup is too young to go for walks (due to not having all her vaccinations yet), it’s still important to make sure she gets enough mental and physical stimulation. You shouldn’t give up on exercise all together simply because she’s a little pup. If you have a fenced-in yard, that makes it so much easier for you. If you don’t have a fenced-in area for your dog, this may be something worth looking into. Make the most out of her training. Walk her around the yard on the leash. Grab some puzzle toys for mental stimulation. All of these can help tremendously. You’ll be surprised at her change in behavior once you implement one or all the above activities. 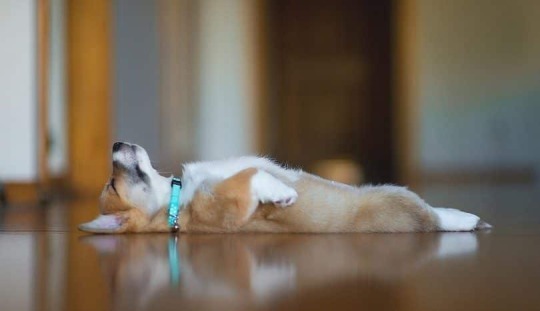 Puppies can’t ‘hold it in’ for long periods of time. Their little bladders don’t have enough control to prevent an accident if they aren’t taken out regularly (not their fault). Your pup could wake you shortly after you fall asleep because they have a dire need to go outside and do their business. To prevent this from happening too soon, be sure to take her out right before bedtime. By taking this simple step, you have just bought yourself more sleep time. When bedtime arrives, you should truly make it feel like bedtime. This might sound like a ‘given’ but you would be surprised at how much we do around the house once we realize it is time for bed. If you have kids, you’re probably getting everything ready for school the next day. This also may be the time you sip your cup of tea. Or, have some quiet time to yourself to calm down from your busy day. If you are around the house finishing things up for the day at bedtime, be sure not to bother your puppy while doing so. To help your dog relax and fall asleep, dim the lights, put on some relaxing music, and give your puppy a nest that smells like you. They may not be directly next to you but will feel closer with your scent near their body. DAP, or Dog Appeasing Pheromone, can also help tremendously with this process. DAP releases the hormone your dog once ‘smelled’ by their nursing mother. Before you pick up your new puppy, look around your home for the best place to allow her to sleep. Prepare your puppy’s bed in advance. Pick a spot for her bed that’s going to be comforting for her. If you’re not sure where that could be, just think of where you would want to go to relax in your home. It’s probably the same for her. Or, maybe you want her to sleep with you. It’s important to note here, if you let your puppy sleep with you in the beginning, the chances of her wanting to do this every night are extremely high. There’s nothing wrong with your puppy sleeping with you but make sure it’s a choice you’re comfortable with. This will be hard to change later if it’s not what you want. If you don’t want to sleep with your puppy, crate training or confinement are two options to consider. Crate training can be the best choice for your puppy if they’re struggling to hold their bladder. If you don’t want to put your pup in a crate, simply choosing a confinement area may work. If you’re using a confinement space rather than a crate, place a puppy pad right next to your pup’s bed just in case she feels the need to go potty while you’re sleeping. If you decide on crate training, your puppy will need a middle-of-the-night potty break. Puppies can’t hold their bladder for more than a few hours. It’s not their fault, their bodies are just not made to hold it yet (P.S.- This is repeated multiple times on purpose. It’s common for humans to punish dogs for having accidents- especially puppies- don’t do this as it can hurt the bond you share with your dog for the rest of her life and it doesn’t help their bladder become larger either). As a general guideline, if you don’t have a toy breed, a pup can hold their bladder for approximately as many hours as they are months old. For example, if you have a four-month-old puppy, she should be able to hold her bladder for up to four hours. Don’t panic if your puppy doesn’t make it this long. And, don’t think they’re having accidents to spite you. They’re still learning. Yes, this is near impossible. Not only are we frustrated with the continuous whining and/or barking, but we usually feel terrible for leaving them in their crate as they’re crying. But, guess what happens if you acknowledge this? Your puppy will learn to get what he wants by crying for it. If they make this connection, you’ll never sleep through the night. Every time your pup wants something, if you tend to her every time she cries, she will be asking you for things all the time. Overall, there are ways to get more rest. But, you aren’t going to get that ‘full rest’ for a few months as your pup continues to grow. If you have someone helping you take care of your puppy, you can take turns letting her outside to go potty. Then, you’re not thoroughly exhausted every day. Yay! You have a new puppy! She’s adorable. You’re thrilled to have her in your family and her health is your first priority. This means taking her to the veterinarian for a check-up and probably some vaccinations (unless she’s up-to-date). Before we go on to discuss vaccinations for puppies, we need to include a disclaimer here. This article is not designed to be a substitute for professional veterinary help. The purpose of this article is simply to help you understand vaccinations. And, make you more comfortable in making your decision of whether to vaccinate. When you’re considering vaccinations for your freshly adopted, furry family member, you may be nervous or scared of reactions to vaccines. That’s perfectly understandable. There are risks and benefits as with everything else. In this article, we’ll discuss adverse reactions/allergic reactions to vaccinations, what to do if you notice a reaction, and the pros and cons of vaccinating. What Is an Adverse or Allergic Reaction? The USDA, who licenses veterinary vaccines, describes an adverse reaction as any event that’s undesirable or unintended. Adverse reactions are those reactions which cause a negative effect to your dog’s health. This also includes failure of a vaccination where your dog’s body doesn’t reaction to the vaccine thus leaving her unprotected. First, we’ll discuss the risks to the vaccinations. Vaccines are generally considered to be safe, so you should just expect your puppy to be her normal happy self. But, just as a precaution, we want to educate you on all possibilities. ‘No side effects’ is what is most commonly seen. Just like when you have received your vaccines as a child, you probably didn’t notice any changes in your health. To the same extent, your dog’s behavior and health should not change following her vaccinations. If your dog is feeling a bit under the weather (sore and sleepy), that’s generally nothing to worry about as this effect only lasts a short period of time. This is less common than ‘no side effects,’ but if your dog is experiencing mild side effects, you may notice a decrease in his physical activity and a little swelling where the vaccine was injected. Keep in mind your dog’s body is fighting an invasion in an effort to create antibodies. Basically, the vaccination is injecting soldiers into our dog’s body. Our soldiers fight the soldiers the vaccine brought in. So, swelling is generally considered normal. For example, the ‘soldier’ in the rabies vaccine is actually the rabies virus… the killed rabies virus. After the vaccination, your dog’s immune system wakes up to make antibodies to the killed rabies virus (the foreign soldiers) so that if it ever sees it again, your dog has protective immunity. In essence, there will be no war because the war was already won by your dog’s own soldiers. If your dog is experiencing soreness, swelling, or fatigue from the vaccines, you should see this disappear after a day or two. There can be serious reactions to vaccinations, but these are highly uncommon. Still worth discussing though just in case, right? Better to be safe than sorry. If you notice any of the symptoms below, you should call your veterinarian immediately. If your veterinarian isn’t open, contact an emergency veterinarian near you. All the above reactions could be due to an allergic reaction to the vaccines and can occur anywhere from minutes to hours following the visit to your vet. The signs of a severe reaction are easily noticeable. The moment you notice any of these reactions, don’t panic as your dog can feel your emotions, but contact your veterinarian immediately. 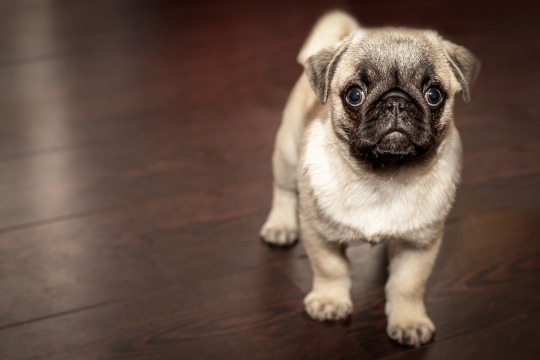 If your puppy is one who has experienced a reaction and you’d hoped to have her vaccinated, the veterinarian usually has other options available. If your puppy does experience a reaction, stay positive. Your veterinarian will have other options for you in the future to keep your puppy protected. These can include individualized booster vaccines tailored to your dog’s lifestyle, providing anti-inflammatories and/or observation for the next round of vaccines, and more. The good is obvious. Your dog is less likely (or has close to zero chance) of contracting the virus she is vaccinated against. Rabies, Parvo, Distemper, etc. This may seem as if it’s not really a big deal after discussing all the risks. But, just think about if your dog were to contract one of the conditions vaccinations protect them against. If your dog were to contract rabies from let’s say, a raccoon, he would experience paralysis of the throat, jaw muscles, foaming at the mouth, lack of coordination, paralysis of his hind legs, seizures, and the list goes on. That would be terrible. And, that’s only one condition out of the list. When it comes to vaccinating your puppy, the benefits generally outweigh the risks. After your pup is vaccinated, he will be protected from a list of preventable dangerous diseases, thanks to you. But, before you make any decisions for your dog, make sure you’re educated. 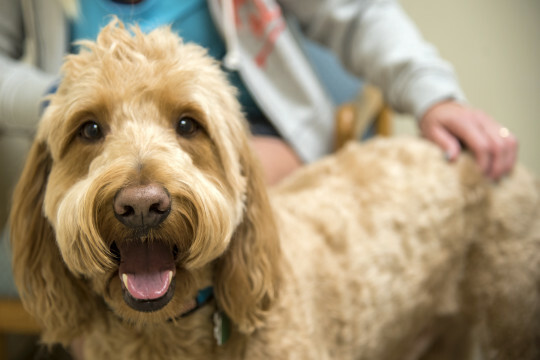 Learn as much as possible about your dog’s health and how vaccinations could impact it. Discuss vaccinations with your veterinarian. Every dog is different. Can Essential Oils Help My Dog? There are so many essential oils companies showing up, too. DoTerra, Melaleuca, Young Living. If there’s so much growth here, then there has to be something good going on here. Onto the big question, though. Do they really work? And, what can they be used for? We’ll discuss this and more in today’s article. Roman Chamomile (Anthemis nobilis): This oil helps to provide a calming ‘mood’ for dogs who are feeling anxious or nervous. Roman chamomile can be inhaled, ingested, or applied topically to your dog. Hops (Humulus lupulus): Hops can help calm a dog who is anxious, nervous, or irritable. This oil can be inhaled, ingested, or applied topically on your dog. Valerian root (Valeriana officinalis): Valerian root is a relaxant and mild sedative. It offers calming and soothing support for your dog when she is experiencing anxiety, panic or some sort of tension. Nutmeg (Myristica fragrans): Nutmeg can help a dog who is anxious or hyperactive with scattered energy. This oil can be inhaled, ingested or applied topically on your dog. Lavender (Lavandula angustifolia): This oil has many uses, but most commonly, lavender can be used to soothe and comfort a dog who is experiencing distress and/or anxiety. This oil can be inhaled, ingested or applied topically on your dog. (P.S.- This oil can also be used for allergies, burns, ulcers, and insomnia). Frankincense (Boswellia carterii): On its own, or with the support of other essential oils that help reduce a dog’s fearful emotions, Frankincense can help reduce extreme stress. This oil is used in severe cases of fear to help a dog ‘come back to the ground.’ This oil can be inhaled, ingested or applied topically on your dog. Violet Leaf (Viola odorata): If a dog is shocked or hesitant toward a situation, violet leaf can be used to reduce feelings of nervousness by providing a feeling of comfort and safety. This oil can be inhaled, ingested or applied topically on your dog. Linden Blossom (Tilia cordata). Linden blossom can assist in providing a sense of safety and trust. This oil is commonly recommened for dogs who have a history of abuse. This oil can be inhaled, ingested or applied topically on your dog. Sandalwood (Santalum austrocaledonicum): Sandalwood provides support on a physical and emotional level. Dogs who have emotional imbalances, worry, or uncertainly of situations are among those who can benefit from this oil. It can be very effective on its own, or in combination with other essential oils. And, can be inhaled, ingested or applied topically on your dog. Vanilla (Vanilla planifolia): Vanilla has comforting and nurturing qualities for dogs who experience nervous tension, irritability, and/or anger. Dogs who have been known to bite are among those who this oil is recommended to. This oil can be inhaled, ingested or applied topically. 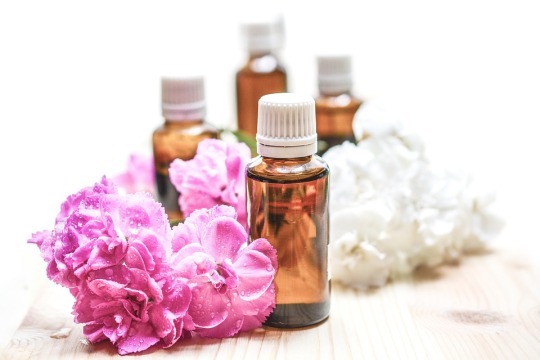 Clary sage (Salvia sclarea): This oil is generally recommended for female dogs but can also be used for male dogs who are experiencing feelings of anger, frustration, and/or mood swings. This oil has been found to have soothing effects. This oil can be inhaled, ingested or applied topically. Yarrow (Achillea millefolium): Yarrow has not only shown the ability to heal physical imbalances, but emotional imbalances as well. This could be a dog who has experienced trauma, neglect, and/or abuse… or a dog who is over-sensitive. This oil can be inhaled, ingested or applied topically. Rose Otto (Rosa damascena). Rose Otto is recommended for dogs who have a history of neglect, abuse, or suffering of some kind. This oil is also recommended for dogs who are displaying any sort of aggression. It’s important to note that alternative veterinarians have a disclaimer with this oil… a dog may continue to display aggressive behavior in the beginning of the use of Rose Otto but you may see positive results once your dog has been exposed. This oil can be inhaled, ingested or applied topically on your dog. Vetiver (Chrysopogon zizanioides): Vetiver provides comfort and reassurance for an anxious dog showing aggression. This oil can be inhaled, ingested or applied topically. Neroli (Citrus aurantium): There are many dogs who do not particularly care for this oil. But, if your dog will accept this oil, it can be used to support a dog who is experiencing depression, grief, or loneliness. This oil can be inhaled, ingested or applied topically on your dog (only if your dog selects its use). Peppermint (Mentha piperita): Peppermint has been known to have a calming effect on dogs (and humans!). And, can be inhaled, ingested or applied topically on your dog. This article just brushes the surface of essential oils. It’s not meant to be a ‘you’re ready to do this’ type of article. You must do your own research before using any essential oil on your dog. Print this out for reference- and ask a holistic or alternative veterinarian if your individual dog would benefit. Remember, every dog is different. And, depending on the health of your dog, some may be acceptable whereas other aren’t recommended. And, not all oils should be treated equal… make sure the oil you are purchasing is of high-quality. There are hundreds of ‘fake oils’ out there. You want your first impression to be as good as it can be. If you try out a ‘bad’ essential oil first, you won’t know if it’s really helpful for your dog (or for you). You should never place an essential oil on your dog’s skin (or let them inhale/ ingest) without first fully understanding the oil you’re using. Bottom line… be sure to do further research before implementing essential oils into your dog’s routine. What is Holistic Pet Care? August 30, 2018 is National Holistic Pet Day. Since many dog lovers are new to this, we would like to share some information about what holistic health truly means. To put it simply, holistic health is an approach to wellness that incorporates a dog’s body, mind, and spirit. Holistic health is about living a preventative lifestyle. Rather than waiting for a condition to happen, the goal with holistic medicine is to prevent that condition from occurring via various wellness techniques. The number of dog lovers who wish to learn about holistic health is increasing significantly each year. Once you have made the decision to learn about holistic health, you can then learn how to strengthen your dog’s food, body, mind, and spirit. As you may have already guessed, nutrition plays a key role in your dog’s health and wellness (and ours, too!). By feeding your dog a diet that’s natural and organic, you provide your dog with a potentially much-needed immune boost thereby reducing the risk of developing health conditions. Our dog’s body (nor ours) is designed to handle the dyes, preservatives, or chemicals that are put in all kinds of food each day. Most dog food (and human food) is overly processed and truly not good for a mammal’s body. Feeding a high-quality dog food can also help your dog fight allergies (one of the main causes of allergies in dogs has to do with their commercial diet). 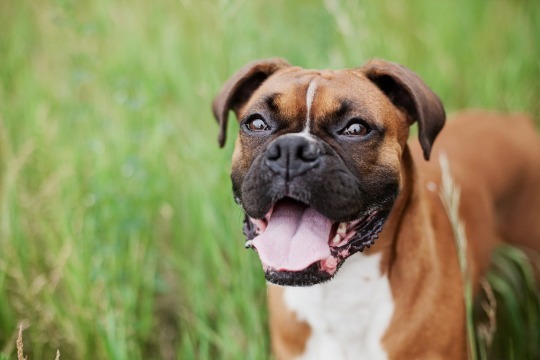 Not only does high-quality dog food help fight allergies but also reduce the risk of obesity, diabetes, intestinal problems, and other food-related health conditions. If you’re having trouble determining what is best to feed your dog, you can search for an alternative veterinarian or holistic veterinarian who has extensive knowledge in this field. Don’t panic if you have been drinking this and allowing your pet to drink it. Most people don’t know those chemicals can be found in city water. You can keep your dog (and yourself) safe by using filtered water, never re-use plastic bottles to fill their water bowl (the plastic bottles really aren’t good either) and be certain to use stainless steel dog bowls rather than plastic doggy bowls. When you think of keeping your body healthy, what’s the first step that usually comes to mind other than diet? YES, exercise. Diet and exercise go hand-in-hand. Not only does exercise reduce excess weight, but it lowers cholesterol levels, reduces anxiety, reduces the risk of heart disease, reduces the risk of diabetes, and can even help reduce the risk of developing various types of cancer! Don’t let exercise get boring, either. Usually, we start off strong and slowly go back to our normal sedentary lifestyle. Of course, walking is the most common form of exercise. But, games like fetch also provide your dog with some healthy fun. Fleas and ticks are horrible… especially in the summer. So, what do we do? We grab that flea medicine to place on our dog’s skin. That absorbs and kills the fleas. Right? If you want to take a holistic approach to your dog’s health, those aren’t really labeled as acceptable. Dog lovers practicing a holistic approach use natural grooming products. And, natural flea and tick preventatives. Usually, this consists of a mix of essential oils. We have discussed nutrition and taking care of the body physically. Now, let’s move on to the mental side of the spectrum. Mental stimulation is a crucial puzzle piece in your dog’s wellness puzzle. A healthy, well-balanced brain is critical. Don’t forget to stimulate those brain cells. If you grab one puzzle, and your dog isn’t a fan, don’t give up just yet. That puzzle may not be for her. Try another. Most dogs also need social interaction with other dogs. Find a compatible dog and go on a doggy playdate. Or, if none of your friends have a dog, take a trip to your local dog park. Let your dog play… a tired dog is a happy dog. We know that’s a lot of information to take in at one time. We just discussed literally every aspect of your dog’s well-being. If you don’t think you can handle all of this at once, take it step by step. Start by ensuring your dog’s mental health is met and move on to their nutrition… for example. And, if you need help, don’t forget your veterinarian is there to help you. At first, we might look at them like they can’t possibly tell. But, they’re right. Your dog does have different bark styles to let you know what they are talking about. This is one of the ways they communicate with you. Each bark serves a different purpose. Territorial barking is that bark that says ‘this is my territory,’ and ‘stay away.’ Their territory does not only mean the area they’re in… it could also be a person (like you), another dog, or even their entire walking space. Does your dog take the same walk each day? Maybe you go from one street to the next, then around the block, each and every day. This could easily become their ‘territory’ if they feel necessary. An attention-bark is just what it sounds like. The attention bark is the sound your dog makes when she is trying to get your attention (or someone else’s). When you hear this, your dog is likely barking at a certain sight or sound. This bark isn’t always a response to something frustrating to him. This could just be in response to an upsetting situation. If you don’t want your dog to enter a certain room and you put a gate up, this could lead to a frustration bark. Your dog is wanting to get into that room, but there’s an obstacle in his way he can’t get through. Another example could be when you’re in an argument with your significant other. This isn’t directly affecting your dog. But, dogs are able to sense our emotions and this could lead to frustration. Yay! The greeting bark! Yay! My family is home! 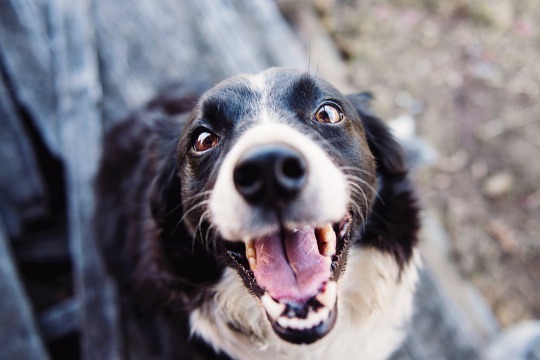 The greeting bark is emitted when a dog is excited to see you! When he is greeting barking, his tail is likely wagging and he’s displaying playful body language. He’s missed you tremendously while you’ve been gone… even if it’s only been a few minutes. Finally, excessive separation anxiety barking generally happens when the dog’s guardian is away from the home. Or, just separated from you in general. This is the type of barking your neighbor would probably complain about when you leave the house. Why? Because the separation anxiety bark is continuous. Your dog is essentially screaming ‘come back, come back, come back, come back’ repeatedly. And, sometimes won’t stop until you return. The separation anxiety bark also lets you know your dog misses you… as frustrating as this may be sometimes. Every ‘bark’ your dog makes means something. It’s important to pay close attention to the way your dog barks. You’ll learn how your individual dog communicates his feelings. And, this will help you build a greater bond with your dog. You’ll understand her wants and needs. Understanding why she is barking will also help you should she ever need behavior modification. And, help you understand if there is something wrong whether that be she’s hurt, there’s an intruder in the home, or otherwise. Is a Dog Training Class Really Worth it? If you’ve adopted a puppy or an adult dog recently, you might be wondering if you should invest time and money into dog training? Is dog training truly necessary or should you just train at home instead? Whether you’re struggling with reinforcing training with your resident dog, or interested in your newly adopted dog being trained, general training (and training all together) has a huge number of benefits to both you and your dog. Dog training services don’t only train your dog, either. There’s so much to learn when you enroll your dog in an obedience class. The first point, and the most important point, is training ensures your dog’s safety and well-being. If your dog is obedient, respects you, and listens to you, she is much less likely to run away and is more likely to come when called. She will escape dangerous situations simply because you asked her not to. Socialization is also key in the process. A trained and properly socialized dog is often significantly less aggressive toward other dogs and people (and even cats!). Not only does this ensure your dog’s safety, but the safety of other people and pets as well. If you have a puppy, start early. If obedience classes are an experience you’re interested in, start as quickly as possible. Sometimes families enroll their dog in obedience classes simply because they don’t have the time to fully train their dog. Dogs in training require an extensive amount of time spent. And, let’s face it, it’s ridiculously difficult to juggle work, family, and everything else going on in our hectic lives. Heck, we might not even have time to shower ourselves some days we’re so busy. If you do have time, it is recommended you train your dog yourself, though. You’ll see why in the following section. Most families don’t adopt a dog simply to say they have a dog in their household. We want to build a strong bond with our dogs and continue to keep that bond as strong as possible. Research has shown trained dogs have a better bond with their family. Now, that’s a bold statement right there. Positive training encourages communication between your dog and yourself therefore opening the lines for clear communication among one another. A dog who is trained understands respect, rules, and other priorities in your home. This allows you, and your family, to experience the most amazing love. Once you lay down a basic framework of obedience rules and commands for your dog to follow, you may decide you want to teach him or her a special skill. It’s completely up to you. As your dog moves further throughout formal basic training, he or she will be able to learn more advanced commands that involve protecting you, retrieving important objects you need when you are unable to, or even alerting you to danger. Your dog is a part of your family, and you know her best, so be sure to do what’s best for her and yourself. If you have any questions, don’t hesitate to contact us here at PetKey! Let’s look at this scenario… and you can let us know if this has ever happened. You have been away from home for several hours. You left your dog at home because she couldn’t accompany you while you were at work. You walk in the door. She’s so excited… acting as if she hasn’t seen you in years. All of a sudden… there’s a little yellow puddle of a pee on the floor. You’re overwhelmed, frustrated, and upset. You didn’t want to come home to clean up pee. Don’t worry. If this has happened to you, please know that it’s a common occurrence. This article will address what excitement urination is and how to manage it. Even if your dog isn’t going through this phenomenon, this article is still worth the read. You never know when you’ll get that new pup (or doggy) who will experience this. Excitement Urination: What is it? Excitement urination generally occurs when greeting your dog. 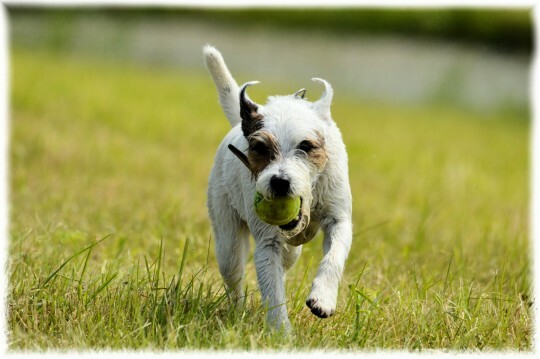 You may also notice some pee puddles during playtime when your dog is getting all wound up. It’s important to note, your dog will not be showing any submissive body language if he’s peeing due to excitement. He won’t be giving you the whale eye. He won’t look scared. He won’t have a hunched back or his tail tucked between his legs. He’ll just appear to be happy. He will probably be jumping around, tail wagging, with those excited eyes staring at you ready to go! Excitement urination most commonly occurs in young dogs and puppies who don’t quite have control of their little bladders. Don’t worry, most dogs get rid of this behavior with time (after one year of age). In some cases, this behavior continues because it’s being reinforced. You may not know you’re encouraging the behavior. If you pet and talk to your dog in an excited manner while she’s excitement peeing, you’ll be letting her know all is well and the likelihood of the behavior continuing is high. Before you do anything, you must visit your veterinarian. Yes, this could be a behavior issue, but it’s important to rule out any medical problems before working on the behavior side. The medical side always comes first. Get the clearance and go from there. In the meantime, greeting and playing outdoors is recommended until you have resolved the problem. Then you won’t be picking up pee puddles (or not cleaning up as much). Be sure to take walks frequently. Take long walks. Take short walks. Mix up the ‘path’ of your walk. Make sure your dog can empty her bladder as often as possible. When your dog goes pee on walks, be sure to praise her and don’t forget the treats. If you feel you’re giving too many treats, you can grab a handful of her daily kibble to give her for being a good girl. Keep your greetings normal. Don’t talk in a baby voice or act overly excited when you get home. We know it’s hard not to. After all, we have missed our pup. But, it’s important. We want our dog to get back on track for our dog’s behavioral well-being (and our own sanity so we aren’t cleaning up pee all the time). Once your dog calms from your return, you can show him some love and give some cuddles. The final point, and the most important point, is not to punish your dog. This is extremely important. If you don’t take anything else from this article, we hope you take this point with you. Punishing your dog severely damages the bond you share. Punishment may work, but it’s not worth breaking the trust you share. And, it could damage your relationship with your dog for the rest of her life. If you’re feeling overwhelmed with the situation, don’t feel bad for walking away for a few moments to take a breath. Calm down. Then return to the situation and think about what’s best. Of course, if you’re feeling extremely frustrated, you may want to book a consult with a canine behaviorist. Be patient. And remember, if your dog is under one year old, this is a behavior that could simply be due to her bladder not being ‘ready’ to hold much urine. Everyone is always talking about a dog’s body language. But, what about cats? Cats have a language of their own, too. They’re clearly more independent than most dogs so they’re harder to understand. Paying attention to their small cues will help you understand your kitty more, though! Your cat’s tail alone can give you some insight on how she’s feeling. If your cat’s tail is up, this generally indicates she’s feeling happy. She’s ready to be approached. Go ahead and walk up to her to show some love. If your cat’s tail is down, you probably don’t want to approach. The tail down generally means your cat fears a certain something or is feeling threatened. Like dogs, cats also wag their tails… but it’s not a good thing. If your cat is wagging his tail quickly back and forth, there’s a good possibility he’s extremely irritated. If the tail wag is slow, your kitty is trying to figure out how she should feel about the situation she’s in. Her ‘mood’ can go any direction at this point. Finally, if she’s rigid with her tail straight up (often known as the Halloween cat pose), she’s not in a fantastic mood. She could be on the verge of completely losing it and you don’t want her to ‘lose it’ on you. The Halloween pose is your cat’s way of making herself look bigger than she is to defend herself. Your cat’s ears can tell you what’s going on in her mind, too (to an extent). If your cat’s ears are slightly forward, he’s feeling happy and could be waiting for your loving hand to run through her silky fur. When your cat’s ears are ‘standing at attention’ straight up, she’s alert and paying close attention to her surroundings. When his ears are turned back, this kitty isn’t in the mood to have anything to do with anyone. He’s feeling irritated, frustrated, and/or plain out angry. This leads us to the next ear position… sideways ears (or back, still). Ears that are sideways or back can also mean your kitty is feeling anxious or nervous about something. Finally, if her ears are flat against her head, she’s feeling scared and/or defensive. This ‘ear stance’ is also an indication of aggression in some cases. You look into your cat’s beautiful gazing eyes nearly every day. But, did you realize there is a TON of information that can be gained from the eyes of your kitty? Take a look at her pupils. If her pupils are dilated, your cat could be ready to play, scared, or surprised. 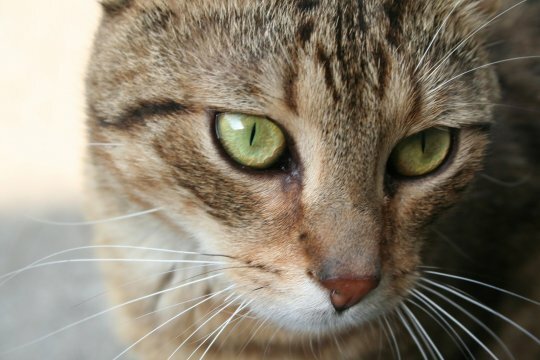 If your cat’s pupils are constricted, this could be a sign of aggression. 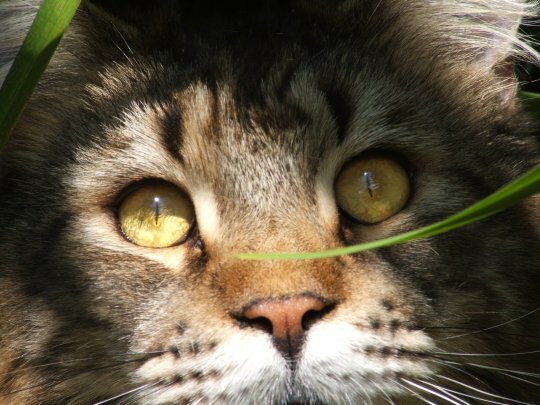 Now, you’re probably asking how you know what your kitty is thinking based on her eyes. It’s important to remember that you need to look at body language as a whole. Have you ever had your cat stare at you? We don’t mean look over quickly and look away again. We’re talking a full out stare contest. If you have noticed this behavior, you have been in a ‘challenge’ with your cat. If your cat’s eyes are half closed… well. What do you think that means? What does it mean when we (as humans) have our eyes half closed? Yes! Those droopy eyes show your cat is relaxed, trusting, and probably ready to take her nap. Now that we’ve reviewed a cat’s body language, the next time you see your kitty, take a step outside of the box and observe her behavior. By paying close attention to your cat’s body language, you’ll develop a better relationship. You’ll start understanding her language and be able to better communicate with her. Don’t panic if this seems extremely difficult at first. 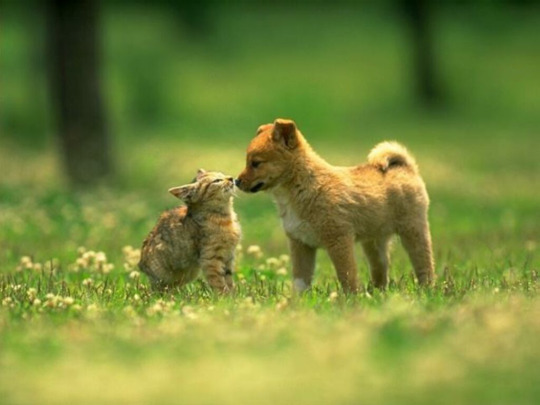 Understanding body language in dogs and cats takes quite a bit of practice in many cases. Most pet parents don’t immediately understand how to read their kitty especially. Take the time. Be patient. You can even keep a journal! You may already know… July is Lost Pet Prevention Month. Yes, we have discussed the importance of microchips several times here, here, and here. But, we think it’s important for you to know the statistics. When we take risks into consideration, as humans, we weigh out if the risk is ‘worth it.’ You may not believe the risk is worth the money and/or worth your time. How do you come to that decision? And, how much of a risk are you willing to take when it comes to your dog and cat? Most families look at their dog (or their cat) as a valued part of their family. What would happen if your furry family member were to get lost? How would you react? What if your dog or cat becomes part of the lost pet statistic? You’ll be surprised how many dogs and cats are lost each year. The American Society for the Prevention of Cruelty to Animals, you likely know as the ASPCA, conducts research about lost pets. What do you think they found as they surveyed 1,000 households with pets? They asked if they had lost a pet in the past five years. Of the 1,000 households, 15% had lost a dog in the past five years… only 85 percent of those dogs were found. Only 74% of cats who were lost had been found. When you first read these statistics, you might be thinking “well, 85% of the dogs were found and 74% of the cats were found.” You might think that’s not really a risk. But, what if your cat or your dog happened to be one of the pets not found? We don’t know about you, but that’s certainly not a risk we’re willing to take. What if She Makes it to the Shelter? The next question that might pop up in your head is ‘if she lands at the humane society, then I’ll definitely find her.’ That’s not necessarily true, either. And, you can’t count on her landing there. The American Humane Association has estimated approximately 10 million dogs and cats are lost or stolen in the United States every single year. That’s a lot! One in three pets get lost in their lifetime. Yes, we know we emphasize microchips here at PetKey. But, there’s a reason for that. A study that was published in the Journal of the American Veterinary Association conducted a research study involving 53 animal shelters. The number of dogs and cats who were returned home due to their microchip is overwhelming. Only 22 percent of dogs who enter a humane society return to their families. But, the return-to-owner rate for microchipped dogs was over 52 percent. That’s a 238% increase! Yes, we’ll take it. That gives us a better chance at being reunited with our dog or cat should he ever get lost. And, the number could be even higher than 52 percent. Only 58% of the pets with microchips had been registered in the database with their information. 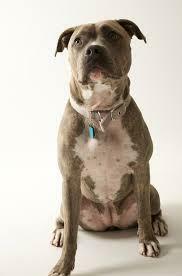 Your dog has the microchip and ID tags on her collar. What else can you do? If your dog gets lost, these two things alone significantly increase the likelihood of her being returned to you. But, is there a way to go a step farther? The answer to this question… yes. There is a way you can take another step forward. That’s with a GPS tracking system. These are fairly common with hunters and rescue dogs since they often wander on their own. The GPS tracker allows your dog to be off-leash (or kitty) … and you’ll know exactly where she is at all times. These devices won’t help your dog be returned to you so that’s where the microchip and ID tag comes in handy. It’s easy to get upset and frustrated when our dog or cat is missing. Getting upset doesn’t help anything. What it does do is ‘fog your brain.’ You need to think clearly when your pet is lost so you’re able to find him. Staying positive and doing everything you can is the way to go. And, before she gets lost, make sure you’re prepared. Better safe than sorry. Elimination problems in cats are not uncommon. And, some cats may stop using their litterbox altogether. Others may use their litterbox for urination but not defecation and vise versa. And, some might only use their litterboxes some of the time. Problems using the litterbox might develop as a result of conflict among other cats in the household. Your cat might not like the cat litter you picked. She might not appreciate your choice of litterbox. Or… it could be some type of medical condition. Once a cat starts avoiding the litterbox, it could become a constant problem. Your cat could develop a preference for a new area… and there’s no telling where that location of choice is until it’s too late. The location could be your expensive fluffy rug in the den… or in the corner of your bedroom. If you notice your cat isn’t using the litterbox, keep an eye out. The best approach to dealing with your cat’s litterbox problems involve making his litterbox as ‘happy’ as possible. The moment you notice your cat isn’t going in the litterbox, that’s when action should be taken. Immediate. Don’t wait long… or else the problem could become much larger. · You haven’t cleaned your cat’s litter box often or thoroughly enough. There are some ‘extra’ yuckies left in there. She doesn’t like that. · You haven’t provided enough litter boxes for your household. Be sure to have a litter box for each of your cats, as well as one extra. Then, there won’t be competition for litterbox space. · Your cat’s litter box has a hood or liner that she doesn’t care for. · The litter in your cat’s box is too deep. Cats usually prefer one to two inches of litter. · Some cats develop preferences for eliminating on certain surfaces or textures like carpet, potting soil or bedding. Find out what that preference is. And, try to mimic it to the best of your ability with the litterbox. Cats have sensitive senses of smell and touch to help them figure out their environment. These senses can affect her litter preferences. Cats who have grown accustomed to a certain litter might decide they like that litter only… and they won’t use any other kind. Like people and dogs, cats develop preferences for where they like to use the bathroom. And, they won’t use the bathroom where you want them to if they don’t like the location. The problem could be as simple as your cat can’t get to the litterbox. Older cats or cats with physical limitations may have a difficult time using certain types of litter boxes. If your cat has some type of medical condition, she may be experiencing painful elimination. Or, if your cat had a medical condition that caused her pain when she eliminated, she may have learned to associate the pain with using her litter box. Even if your cat’s health has returned to normal, that association may still cause her to avoid her litter box. Stress can cause litter-box problems. Cats can be stressed by things that their owners may not think of as a big deal. Have you moved recently? Have you swapped bedrooms with someone else in the household? Have you moved their litterbox to a new location? · The majority of cats like clean litter boxes, so scoop and change your cat’s litter at least one to two times a day. Rinse the litter box out completely with baking soda or unscented soap once a week at minimum. · Most cats like a shallow bed of litter. Provide one to two inches of litter rather than three to four inches or more (and yes, there are many cat lovers who think their cat should have a pile of litter). · Most cats prefer clumping, unscented litter. If there’s a fragrance to the litter, your cat may avoid the litterbox. 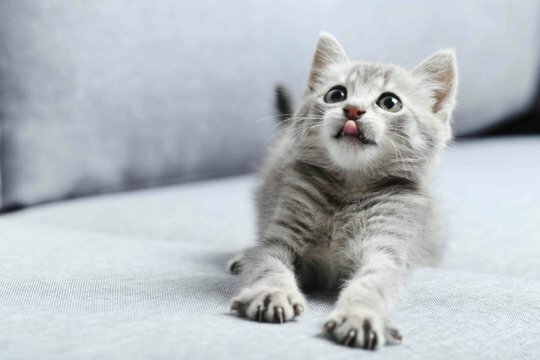 · Your cat may prefer the type of litter she used as a kitten. Try to remember what type of litter she used back then. · Cats like their litter boxes located in a quiet but not “cornered” location. They like to have the ability to watch for dangerous situations. If your cat associates her litter box with something negative, you can work to help her develop new and pleasant associations. It’s important to note that cats can’t be forced to enjoy something, and if you try to force her it will likely only make the problem worse. Generally, it’s usually not a good idea to try to train your cat to use her litter box by offering her treats like you would a dog, because many cats do not like attention while they’re eliminating. However, a professional animal behavior consultant, such as a Certified Applied Animal Behaviorist (CAAB) or a board-certified veterinary behaviorist (Dip ACVB) may be able to help you design a successful retraining or counterconditioning program. Check out the article, Finding Professional Behavior Help, for information about finding an applied animal behavior professional. Most importantly, do not scold your cat for her litterbox problems. This could severely worsen her behavior and she will no longer trust you. She is also likely to be afraid of you if you begin to scold her. We want to keep the bond we have built with our cat while determining the best way to solve the issue. You have found the perfect cat. She’s everything you were looking for and more. Now what? Is there any preparation that should be done before you bring your new kitty home? There are some guidelines you can follow to help the transition go a little bit smoother. Cats are territorial animals. Bringing a cat into a new environment can be extremely stressful. There’s so much that’s new and different from their previous ‘home.’ And, your cat is going to be unsure of what to do with all that room to roam. Before bringing your cat home, find a space that can be dedicated just to him for a few days (or weeks if necessary). Most kitty lovers usually utilize the bathroom or laundry room for this phase. Once you have found the perfect space for your new kitty, add all your cat’s special goodies to the room. Add the litterbox. Add food and water. Add toys. And, if you’re really wanting to furnish the area completely, grab your cat a scratching post. Now that you have set up the space where your kitty will call home for a few days, start exploring the rest of your home with a cat’s eye view. What could your kitty get stuck in? Is there any way she could escape? Are there any items that should be moved so your cat doesn’t damage them? Cover up any holes leading to ‘unknown’ areas. Think of everywhere your cat could potentially hide. Then, you won’t panic immediately if you don’t see her for a few hours. The first day can be extremely easy for your cat or ridiculously overwhelming. You don’t know until he arrives and is able to explore. Once you arrive home, immediately take her to the space you have made for her. Open the cat carrier. Let her come out at her own pace. Don’t force her to do anything she doesn’t want to do. If there are other people in your home, the visits should be kept to a minimum. One or two people in the room at a time is overwhelming enough. But, you do want her to acclimate to everyone in the household. Observe how she feels around you versus others. If she’s comfortable, she is able to move a bit faster in the process. Once she comes out of the carrier, take a seat on the floor and let him come to you. Again, don’t force her. She will come on her own time. If she doesn’t approach you during this phase, don’t panic. Leave her alone and return later. Some cats may only come out at night, too. If your kitty doesn’t want to see your during the day… you could try in the evening when life is quieter. It’s also important to keep in mind- your newly adopted kitty may not each much at first. Or, maybe not at all. When she is ready to eat, be sure to provide her with the same food she ate at her previous home or shelter to avoid stomach upset. Within one week of adoption, you should take your cat for a routine visit with the veterinarian. Just to make sure all is well. If you have a copy of immunization records from the shelter, bring those to the vet so he or she can have them on file. You may also find out what types of toys your cat prefers during the first week (don’t panic if it takes two weeks). And, if you can, grab a cat perch to place up next to the window. This could be your cat’s favorite place in the home and she would still be out and about to be social. Most of all, it’s important to understand that each cat is her own unique ‘person.’ Some cats are shy. Some cats are outgoing. No cat is the same. Some cats take only a few hours to acclimate to a new home. Some cats take weeks. You never know. But, one thing is for sure. If you are patient and you put time into your new kitty, you won’t regret doing so.